While BlinkM is primarily a tool for hardware experimenters, anyone can have fun with BlinkM. This is a quick-start guide to create your own custom light patterns with a BlinkM. No previous programming or hardware skills are required. However, to get the full use out of a BlinkM, you will want to learn a bit more about Arduino or similar microcontroller and download the BlinkM datasheet. 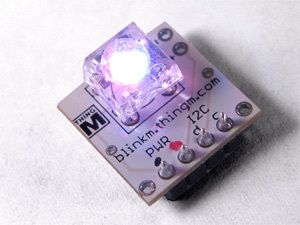 BlinkMs are available at Sparkfun. They come fully assembled. Arduino USB boards are also available at Sparkfun and Adafruit. The Arduino Uno board is the recommended board to get. It costs about $30. Once you have an Arduino board, you can install the Arduino software on your computer to talk to it. Follow the normal Arduino setup guide for Windows or Arduino setup guide for Mac OS X. If you already have an Arduino, be sure to have the latest Arduino software (Arduino-0010 currently). At the end of the Arduino setup, you’ll be running the Arduino software environment and be able to blink the Arduino’s on-board LED. BlinkM Communicator is an Arduino “sketch” (‘sketch’ = ‘program’ in Arduino terminology). It enables the Arduino to be an interface between you computer and the BlinkM. Unzip the download (BlinkMCommunicator.zip). Open the sketch (called BlinkMCommunicator.pde) in the Arduino programming environment. Then press the “Upload to I/O Board” button in the top row of buttons. You’re done with the Arduino programming software for now, but feel free to use it later to play. Arduino boards can do much more than just interface with BlinkM! Unplug the Arduino from the computer. ALWAYS unplug Arduino before plugging in a BlinkM. The BlinkM’s PWR (power) pins should line up with pins 2 and 3 of the connector, while the I2C (communications) pins should line up with pins 4 and 5. 3d. Connect and Program your BlinkM! Press “Set connection” and choose your Arduino’s port, as selected in Step 2a. It should be listed first, though it may not be. Press “Upload” to save your sequence to the BlinkM. Now your BlinkM will play back your programmed sequence whenever power is applied to the BlinkM. 3e. Disconnect, Unplug, Hook up to a Battery! Attach a power source to pins 2 and 3, with + to pin 3 (“+” on some BlinkMs, a red dot on others) and – to pin 2 (“-” on some BlinkMs, a black dot on others). Use only 3v-5v power sources such as coin batteries or power supplies to power BlinkMs. DO NOT use 9v batteries or any power supply that puts out more than 5.5v, YOU WILL DESTROY THE BLINKM.